RB Casa Maybelline Sateen Bedding - Swatches may be available. 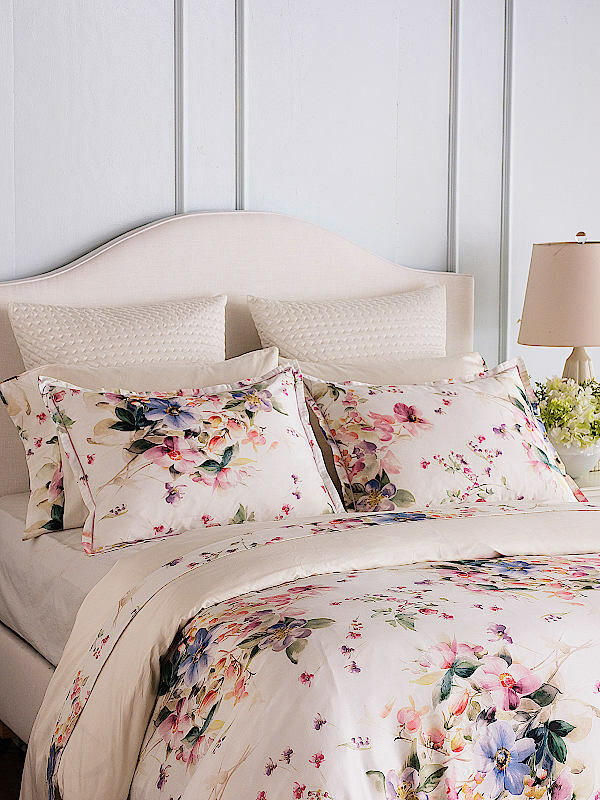 Printed sateen cotton bedding with a plethora of beautiful flowers. Flat Sheets - Solid sateen finished with 4" border applied on the edge. Fitted Sheets - Solid sateen finished with elastic all around. 17" gusset. Shams - Allover printed sateen finished with 1 line embroidery. 1" miniflange central inner flap opening on the back. Pillow Cases - Solid sateen finished with 4" printed border applied on side opening. Inner flap. Duvet Covers - Top printed sateen reversed to solid. Hidden buttons closure. Fabric is available or you may contact us for custom projects. Our swatch program allows you to return fabric samples within 15 days for a full refund. Top printed sateen reversed to solid. Hidden buttons closure. 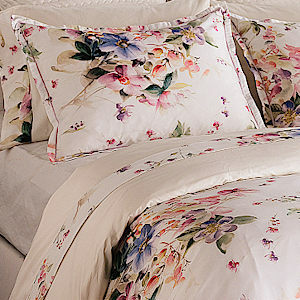 Ensemble Includes 1 duvet cover and 2 shams. Ensemble Includes 1 Flat, 1 Fitted and 2 pillowcases. Solid sateen finished with 4" border applied on the edge. Solid sateen finished with elastic all around. 17" gusset. Sold as a pair. Solid sateen finished with 4" jacquard border applied on the opening and Inner Flap. Allover printed sateen finished with 1 line embroidery. 1" mini flange central inner flap opening on the back. Center pleated. 3" decking border with linings. Split corners with kick pleated. 16" strandard drop.